A spavinOsteoarthritis of the hock., which is osteoarthritisChronic inflammation with a degenerative process in a joint. 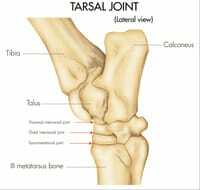 of the lower joints of the tarsus, is the main degenerativeCaused by wear, and associated with activity, work or ageing. disorder affecting the hock. A spavinOsteoarthritis of the hock. is a chronic degenerativeCaused by wear, and associated with activity, work or ageing. disease, which appears with age and work: it is manifested by changes in the bone of the hock, bone demineralisation and proliferation, which are very painful phenomena resulting in chronic lameness. When lameness occurs in a hind leg, the damage is in the hock in 30 to 40% of cases. Located at the point at which propulsion and absorption forces meet, the hock is made up of complex joints, which are subject to major stress when a horse is working. 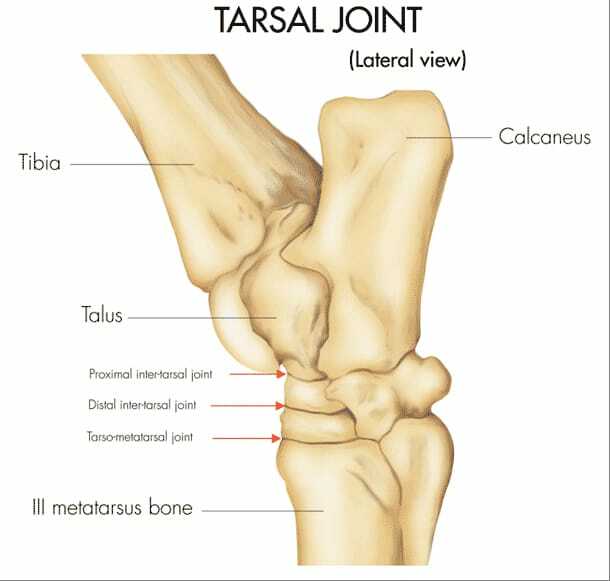 The bony stages making up the tarsus, connected by joints that are almost immobile, have an essential role in absorbing impact. The low motion high loading joints never get a rest even when the horse is standing still. These joints are under great stress during sporting activities, in particular in competition horses and trotters which are therefore the groups most affected by spavins. However, this condition can also appear in young horses, and, at any age, lack of balance in the hock is a major predisposing factor.